In the 1970s there was a boom in the kit manufacturing business, with the established UK firms Bukta and Umbro being challenged by a new English brand called Admiral. By 1977, nearly every top flight club in England and Scotland had signed a deal with one of these three brands. Germany manufacturers Adidas, who supplied kits for a vast number of teams across Europe, had yet to breach the UK market, but in 1977 they won deals with Nottingham Forest, Ipswich Town and Middlesborough in England, and Dundee United became the first Scottish team to agree a contract with the European firm. The new Adidas produced kit was made from artificial polyester fabrics instead of the more cotton based material, which gave the kit a slightly lighter tangerine look. The shirt had the famous Adidas three stripes that ran from the collar down each sleeve to black cuffs. The typical 1970s style collar was replaced with a black V neck with black lapels. 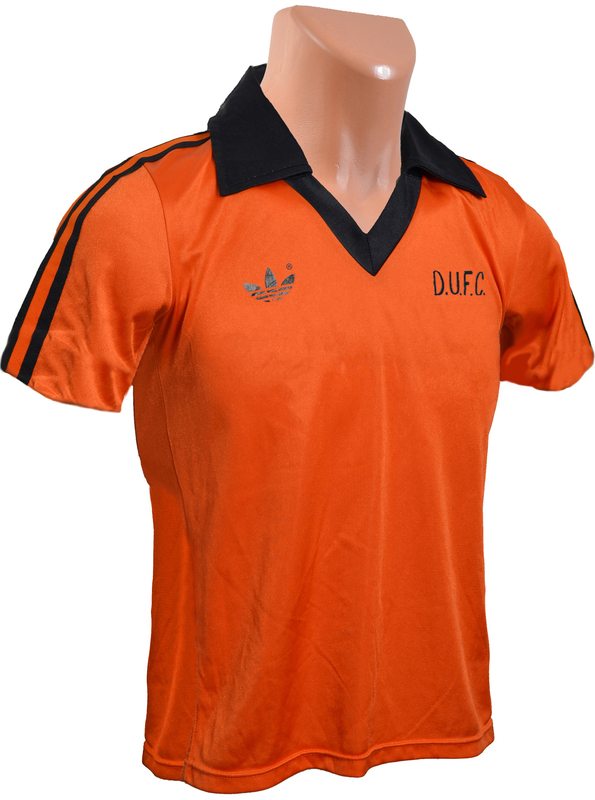 The diagonal DUFC motif that had been on the shirt since 1973 was now replaced with a more modern looking DUFC that ran horizontally on the left breast, and on the right was the Adidas logo. The black shorts had three Adidas tangerine stripes down each side, and the Adidas logo on the bottom left. The tangerine socks were topped with three black stripes on the turnover. The new kit made its competitive debut at Parkhead, where United drew 0-0 with Celtic in the opening Premier Division match of the 1977/78 season.